In the colder months, sometimes we want to step away from our refreshing smoothies and have a breakfast with a little more warmth and comfort. Although porridge is normally the “go-to” Winter breakfast, there are many other healthy hot breakfasts to keep you satisfied until lunch. Our tofu scramble recipe is the perfect savoury Winter breakfast, and the vegetables can easily be altered to suit whatever is in your fridge at the moment. This tofu scramble recipe is also vegan and gluten free. 1. Whisk together soy sauce, sesame oil, nutritional yeast, garlic powder, sea salt and cumin in a large mixing bowl. Set aside. 2. Drain and press any excess moisture out of the tofu between paper towels or clean cloth towels. 3. Break/crumble tofu into bite-sized pieces and stir into the mixture of oil and spices until lightly coated. The tofu should soak up the mixture and be yellowish or tan in colour. Add a bit more oil, yeast and soy sauce for extra flavour or if the mixture seems too dry. 4. Lightly oil a large skillet and cook tofu over medium-high heat for about 10 minutes, flipping occasionally for even browning. Each side should be lightly browned – under-done tofu will be too mushy, so don’t be afraid to cook it until the texture is right! Set aside. 5. Add about 1 tsp of sesame oil to the bottom of another skillet. When warmed through, add the onions and cook until soft and lightly browned. 6. Add broccoli, spinach, sun-dried tomatoes, 2 tsp of soy sauce, and 2 tbsp of nutritional yeast (or more, to taste). Stir to combine and cook covered for about 5 minutes or until broccoli is cooked to your liking. 7. Stir cooked tofu into vegetable mixture, heat for a minute or so to combine, and serve. This tofu scramble recipe goes great with toast, and has a texture much like scrambled eggs, so it’s perfect if you’re after some plant based proteins to kick start your day. 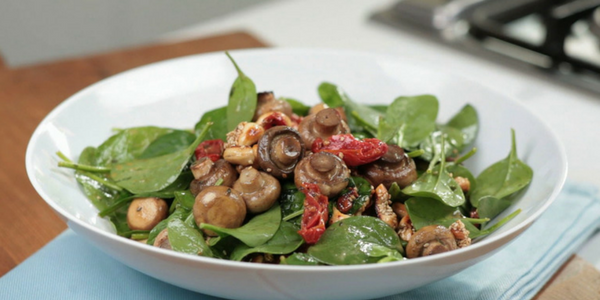 You can mix up the vegetables as well if you don’t have the ones in the recipe, so it’s versatile and easy to switch up a bit! 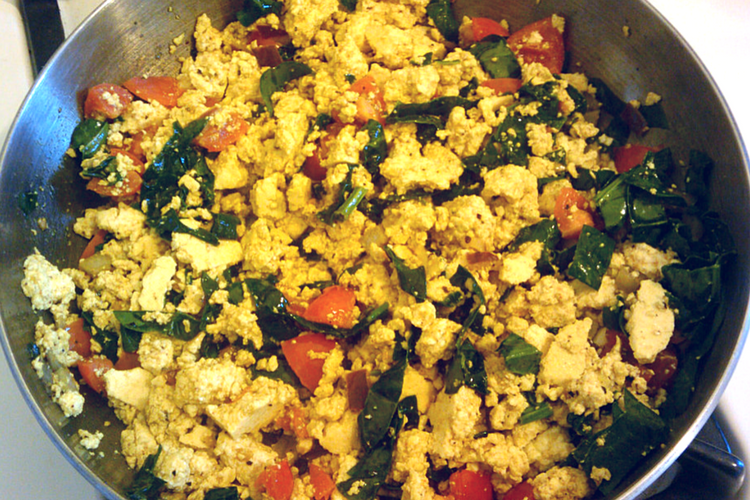 Vegetables such as broccoli and peppers work well with the tofu scramble. Bon appétit! If you liked this recipe, then try our warming breakfast porridge recipe!